I have reviewed other wool dryer balls before, and I've even tried my hand at making my own (in my early days of cloth diapering). Making my own was very satisfying, but sadly--despite my mixture of following online tutorials plus adding my own creative flair--my dryer balls quickly fell apart and were totally useless in a matter of weeks. I was a big fan of The Willow Store's small, lightweight wool dryer balls when I reviewed them, and so when Cyndi of Wooly Rounds expressed interest in sending some of her dryer balls my way, I was excited to give them a go! No matter which type of wool dryer balls you settle on using, their benefits are numerous. 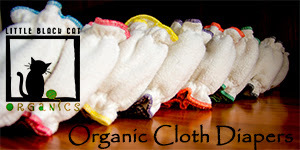 Wool dryer balls are totally eco-friendly since they contain no chemicals or additives. Instead, they assist in shortening the drying time of tumbling laundry through mechanically lifting and aerating the load. They also assist in softening laundry without the use of commercial fabric softeners, waxes, and chemicals. Their pummeling action softens fibres gently and also helps to reduce static cling. Since wool has natural antimicrobial properties, these balls remain clean, fresh, and maintenance-free. Some wool dryer balls are made with yarn, and some are made with roving (a combed type of wool). 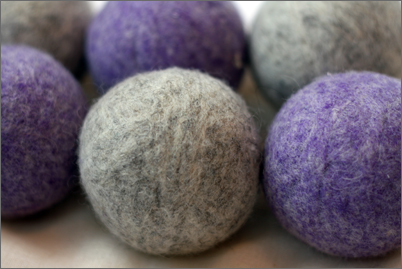 All wool dryer balls should be felted (matted down) before using, or they will loosen and come apart during use. Knowing all these things, I was excited to get Cyndi's package in the mail. Since I started cloth diapering about a year ago, our household has gone completely dryer sheet and fabric softener free. For years I had found that the fragrances of these products were agitating me, and having a baby (and cloth diaper loads!) was the last push I needed to completely eliminate these products from our house. And, since using wool dryer balls, I can honestly say I do not miss the dryer sheets ONE BIT! The wool dryer balls are actually much easier and cheaper to use since you buy them once, stick them in the dryer once, and then forget about them. That's right--you never have to remove them from the dryer if you don't want to! Just stick them in and forget about them, and they'll do their job on every load, whether delicates, diaper laundry, or towels. It's one less step in having to remember to throw in a dryer sheet and then pick it out of your laundry load later on. I'm all about minimizing! When the Wooly Rounds parcel arrived, I was impressed with Cyndi's commitment to being eco-friendly, right down to the packaging material that the dryer balls came in. Even her shipping envelope was completely recycled & eco-friendly (no bubble wrap required! ), stuffed with a recycled paper type of insultation and cushioning. Once I got the envelope open, my Wooly Rounds were gorgeously packaged in a cotton sachel--this would be great for storing them or traveling with them if need be. Wooly Rounds are available in natural grey sheep's wool or in softely tinted colors of Spice, Gold, Lake Blue, Spruce, Garnet and Mountain Laurel. Mine were the gorgeous grey and light purple roving. I loved how soft and natural they felt and looked. They were also felted to perfection--there were no loose ends or lumps anywhere, and the balls were perfectly round and firm. I had much more confidence in these than in my homemade ones that sadly let me down! Although I love the Willow Store's lightweight, smaller dryer balls for tiny loads of laundry (like when I'm only tumbling dry diaper liners and inserts), I found myself sometimes needing a little more "oomph" for larger loads, like towels, bedding, or jeans. These Wooly Rounds were just what I had been searching for. I love that, having 6 of them, I could choose the right amount for the load size I had. In smaller loads I would leave only 2 or 3 balls in the dryer and for larger loads I would replace all 6 in the drum. Like all the dryer balls I've used, I do find that these shorten drying time (I pretty much only dry all my laundry on permapress or delicate now, and it typically comes out dry or damp dry how I like it). Static also hasn't been a problem, and the laundry comes out soft (true, not AS soft as with the chemical sheets, but soft enough for us, and I like that it's all natural & healthy for our skin and breathing!). The only down side, at times, to these dryer balls is that--there's no way around it--they do make an audible noise as they bounce around in the dryer. All dryer balls, whether plastic, wool, or rubber, will do this. Some people love this, others hate it, and many are indifferent. I personally don't mind the "thump thump" the majority of the time. I even find the rhythym calming as we fall asleep at night in our quiet house. However, there are rare times, like when we have company visiting in our family room outside our laundry room, where I might remove the dryer balls or postpone tumbling the load until our visitors have left. 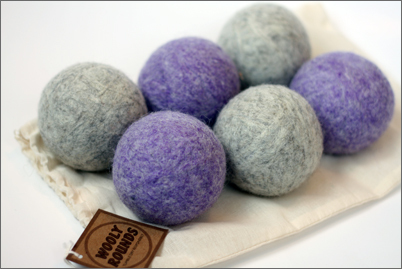 Head over to the Wooly Rounds website right now and buy your very own eco-friendly wool dryer balls for only $7 a piece! 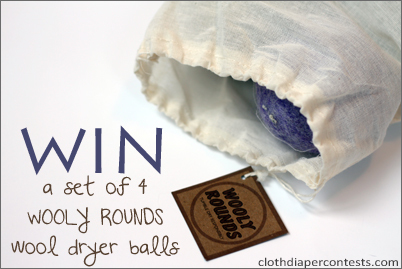 Wooly Rounds is also offering one lucky winner a set of 4 Wooly Rounds eco-friendly wool dryer balls! Make a purchase from the Wooly Rounds online shop and allow yourself one extra entry per dryer ball purchased! Final details: I received no financial compensation for this review or giveaway, though I did receive the sample items free of charge. All opinions shared are my own, and I was not persuaded to share anything other than my own thoughts. Other users may have different experiences with this product than what I have shared. This giveaway will end on September 26, 2011 at 11:59pm MST and is open to residents of Canada and the USA only. Winner will be chosen randomly using random.org’s services. The winner will be contacted by email and will have 48 hours to reply before a new winner is chosen. The prize will be supplied and mailed out to the winner by the sponsor of this giveaway. I follow you on Twitter as 1mommabear. 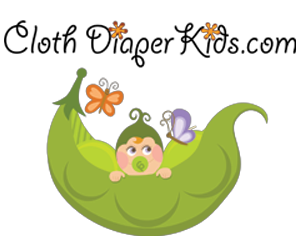 I like Cloth Diaper Contests and Giveaways on Facebook as Vanessa Carvalho Coker. I like Wolly Rounds on Facebook as Vanessa Carvalho Coker. Following @CDcontests on twitter as @VanessaCoker. I follow our blog with the Networked Blogs as Vanessa Carvalho Coker. I like you on FB as Ashley Mullen. Liked Wooly Rounds on FB and left a comment on her page! I follow with GFC (jillparrett). 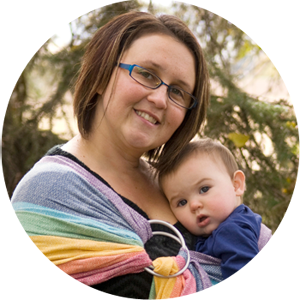 I "like" you on FB (Jill Ann Parrett). I "like" Wooly Rounds on FB (Jill Ann Parrett). I have 3 seconds from Wooly Rounds. Love them! I follow you on Twitter (jillannparrett). I follow Wooly Rounds on Twitter (jillannparrett).